Out Of This World, Galaxy Jewellery Designs! 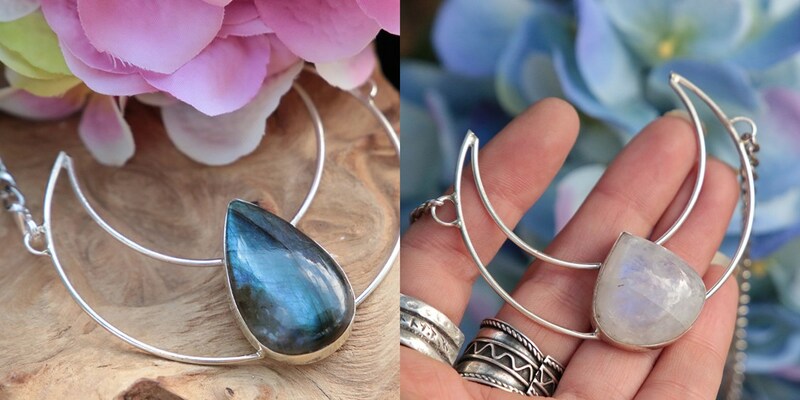 Discover out of this world jewellery designs trending right now! We've also created The Galaxy Collection, filled with gemstones, charms and more which we think fits perfectly with this trend! William White creates an out of this world solar system ring! 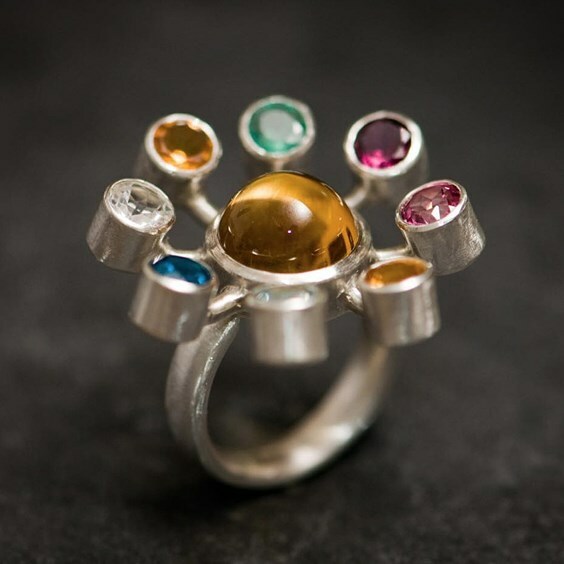 Using faceted stones to represent each of the plants and a gorgeous citrine cabochon centred in the middle. A wonderfully unique design! 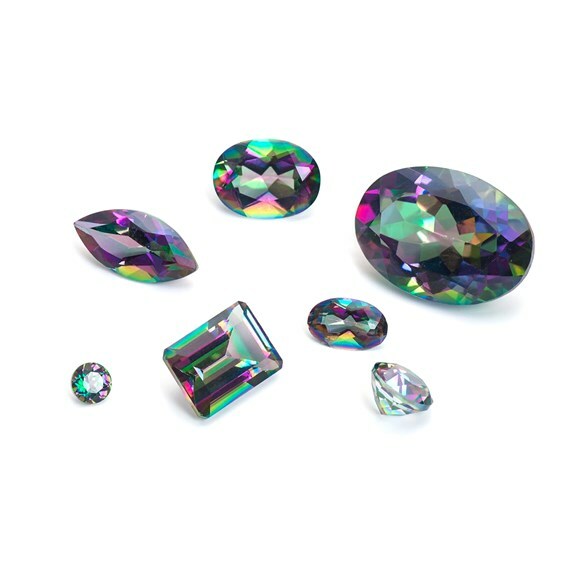 Shop our range of faceted stones in a range of shapes and sizes for your handmade jewellery designs. This photo features our mystic fire topaz, they have a mesmerising titanium coating making them dazzle in a kaleidoscope of pretroly colours. A great choice for those galaxy inspired designs. Ruby Sparrow Design creates the most beautiful statement designs using one of a kind gemstones such as labradorite and rainbow moonstone. 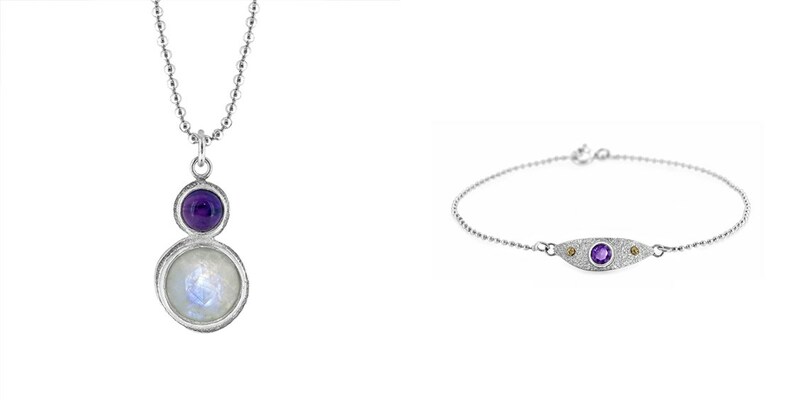 These gemstones create a beautiful range of natural colours, which make these moon inspired pieces even more magical. "I love making these mystical pendants and I love wearing them even more! Who doesn't love the moon?" A Frozen Star - "Blue goldstone looks like a tiny galaxy." We couldn't agree more and how beautiful is this ring? Did you know that blue goldstone is a manmade stone that was discovered by Italian monks? 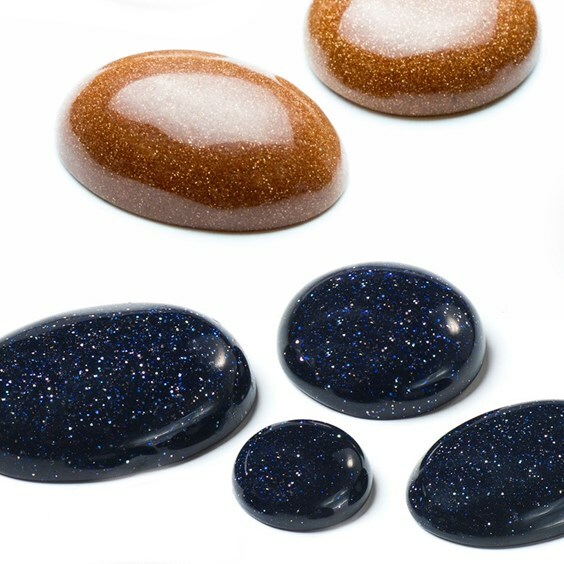 Goldstone is produced when metal particles are suspended within glass to give it its magical twinkle! Copper is used in the brown-red version of goldstone and cobalt is used in the blue variety to make silver flecks. 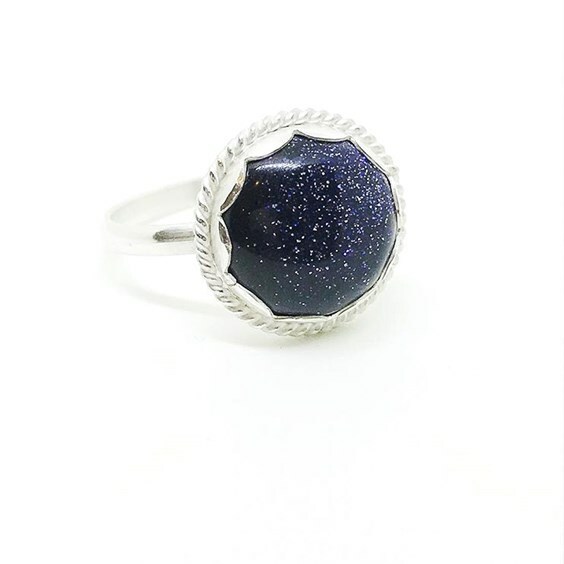 We think that blue goldstone looks just like a starry night sky! La Femme Boheme is known for creating utterly stunning statement designs using mainly turquoise and labradorite stones. 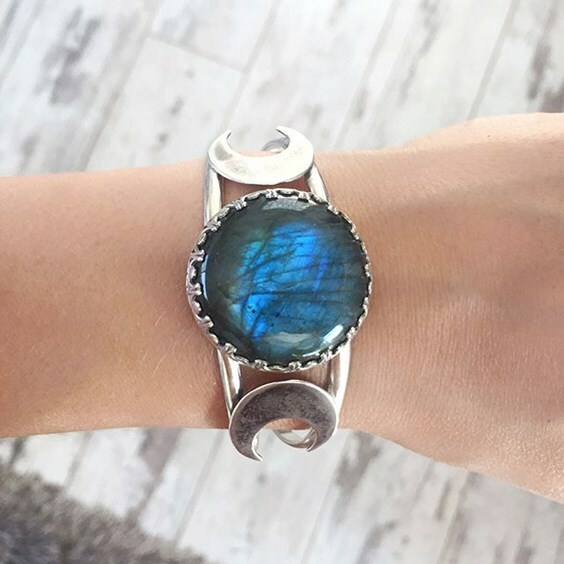 All of Vivian's jewellery is inspired by Mother Nature, and moons make a strong appearance in many of her designs - we are so in love with this chunky crescent moon and labradorite cuff! 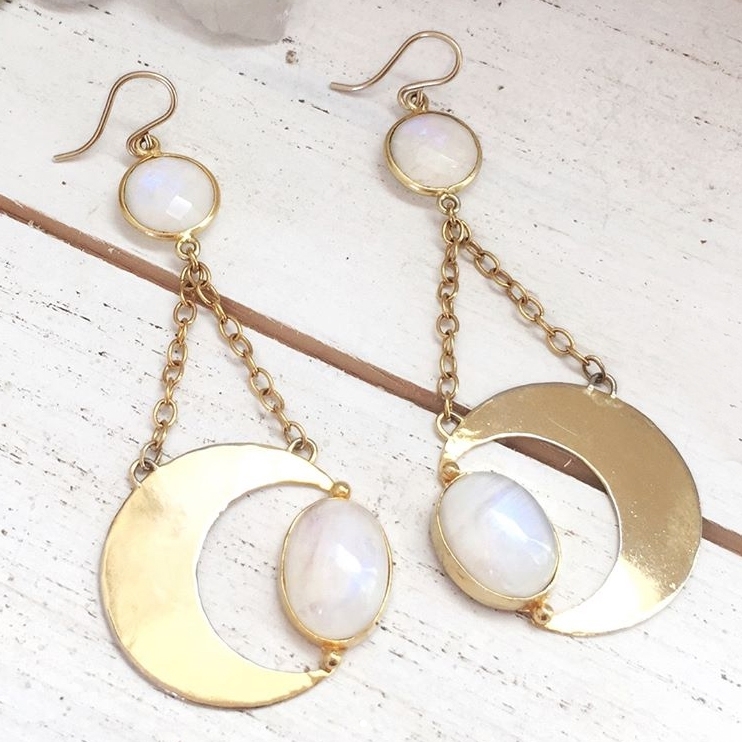 Somachi from Machi Jewelry designs a lovely range of gemstone jewellery, including a collection of 'Adroa' crescent moon rings using amazonite, garnet, labradorite, rainbow moonstone and amethyst. 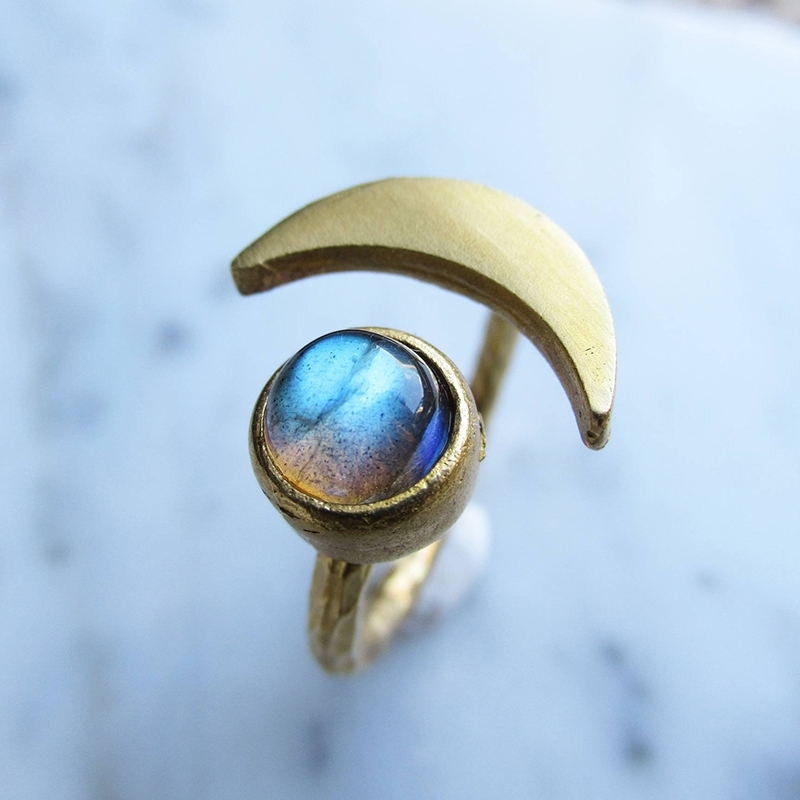 The boho ring featured above is made using brass and features a gorgeous labradorite cabochon. We love how the band has a gorgeous hammered effect which adds texture to the design. Labradorite has a strong presence when it comes to galaxy inspired jewellery! This magical gemstone has a beautiful play of colour, its stunning iridescent is caused by internal fractures that reflect the light back and forth. 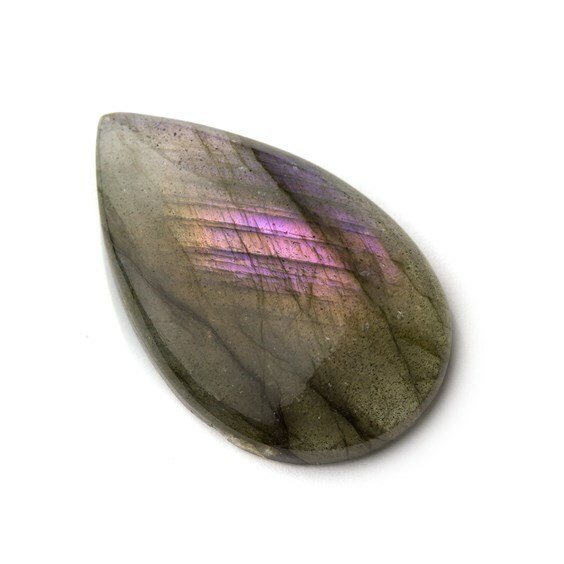 At Kernowcraft we have a brilliant range of labradorite cabochons, faceted stones and beads for your handmade jewellery designs - including one-off pieces for those statement designs. 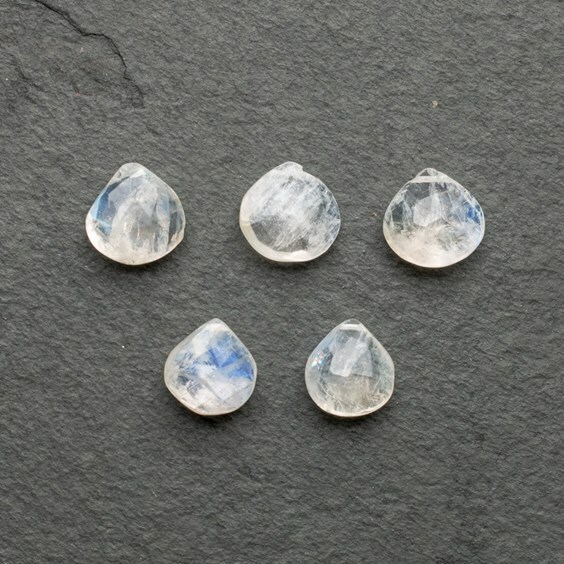 Moonstone is such a popular gemstone, it has a gorgeous glowing sheen of blue and white - resembling magical moonlight. It's available in a range of colours such as grey, brown, pink and of course rainbow! At Kernowcraft we have a range of stunning moonstone cabochons, faceted stones and beads in a range of variations, shapes and sizes. 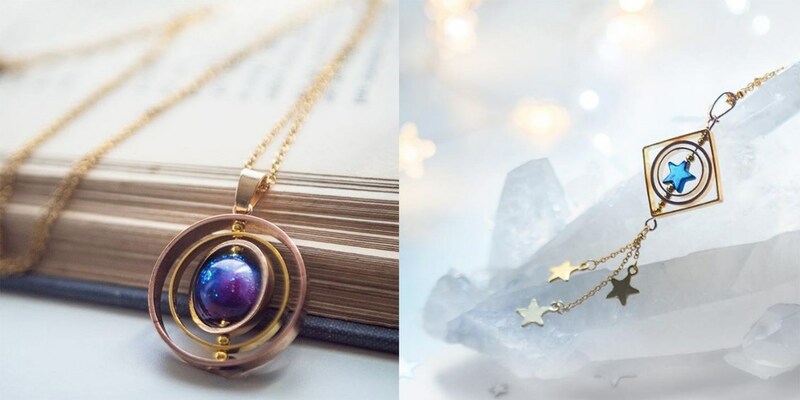 Bea from 13th Psyche has created a new collection of galaxy-inspired jewellery. This includes spinner necklaces featuring planets, asteroids and shooting stars! This collection is so creative and unique, the perfect gift for those who love astronomy. The necklaces are created using brass, with a bead placed in the middle and completed with a delicate chain. La Femme Boheme - "My favourite combination - moon and moonstone! Aside from the obvious play on the word, I feel like the cosmic theme is deepened when I combine both components into a piece, like these earrings I made a while ago..."
Link settings and connectors are a great way to experiment with jewellery designs. They are so easy to incorporate into designs, whether you want a double sides multi-layered look, simple pendant or a drop element in your piece. 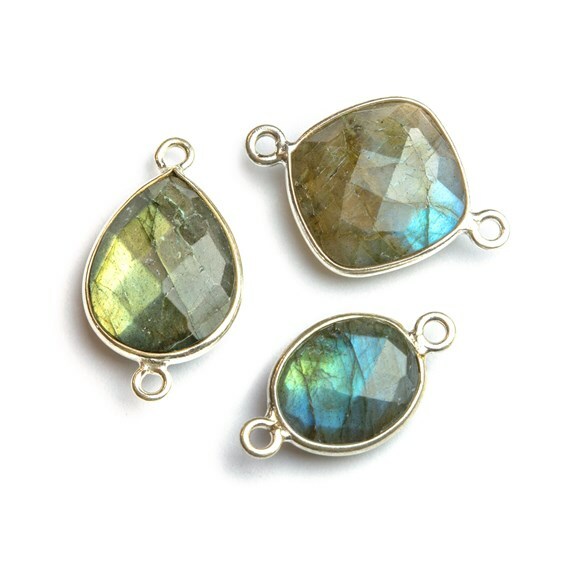 At Kernowcraft, we have a range of bezel set gemstone link connectors including labradorite, chrysoprase, prehnite and chalcedony. 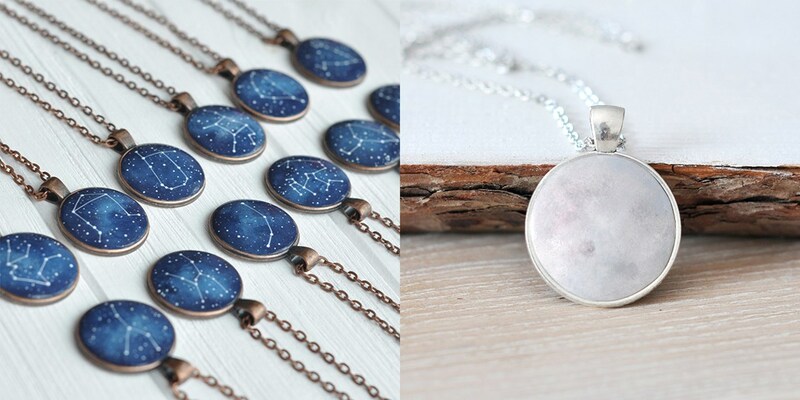 We absolutely love the idea behind these zodiac necklaces. Liliia from Magic Twirl creates hand-painted necklaces with acrylics and very small brushes! Each item is protected with a varnish coating, making these necklaces perfect for birthday gifts. Sometimes keeping it minimal can be the most effective! 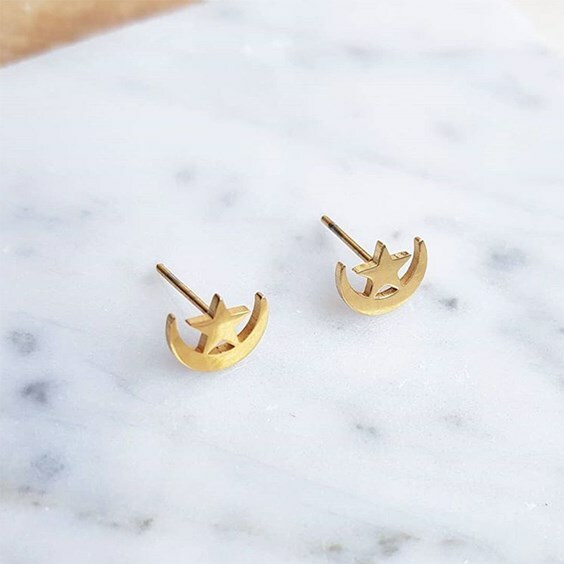 These mini crescent moon and star stud earrings made by Machi Jewelry are so simple and lovely. 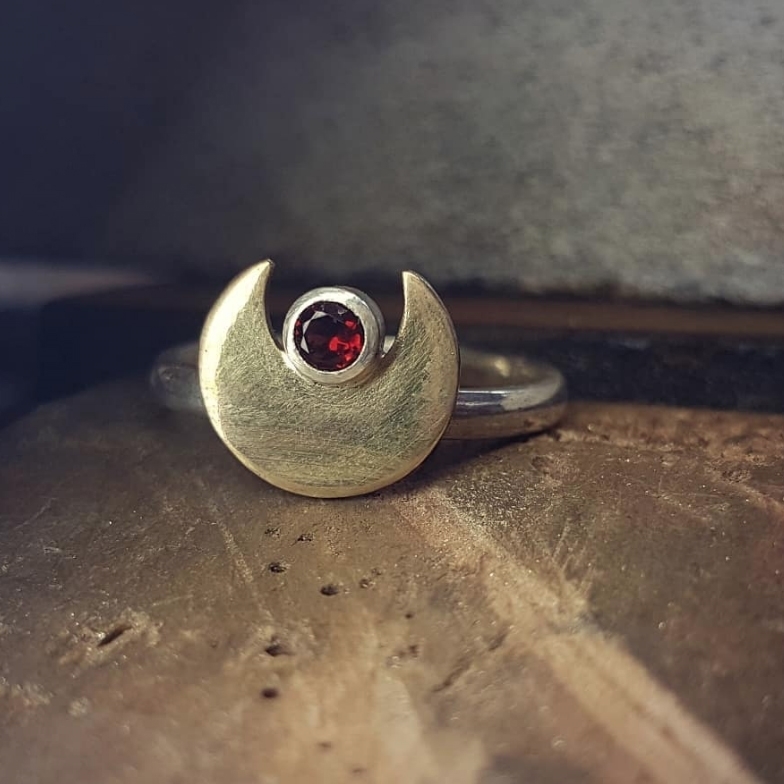 We love this custom order made by Oonagh, featuring a blood red garnet and a brass crescent on a sterling silver ring. Vikki Hall has created a brand new cosmos collection and it's really beautiful. We love the combination of amethyst, moonstone and citrine. Read our 'Meet The Jeweller' interview with Vikki where we chat all about her new collection, her studio assistant Reggie, branding tips and her plans for the future. Shop opals, blue goldstone, diamonds, labradorite, moonstone and so much more in our new jewellery collection inspired by galaxies, starry skies to the moon!